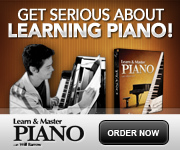 This is a sample of the beginners piano course that they offer called Learn and Master Piano. The instructor is Will Barrow, who is a Grammy winning pianist. These 5 videos are part of the 5th lesson of the series and deal with triads and how they relate to one another within a major scale. They introduce the idea of minor triads (assuming that we've already learned about major triads) and move on to cover chord progressions, etc.